Ride the rails of history on the Excursion Train as it tours through ten miles of the beautiful farmland and scenic Smoky Hill River countryside between Abilene and Enterprise. Using a vintage diesel-electric locomotive, a century-old wooden sided passenger/diner, open air observation cars, and a caboose, families with kids of all ages will enjoy this interactive adventure perfect for a casual family outing or picnics in the summertime. 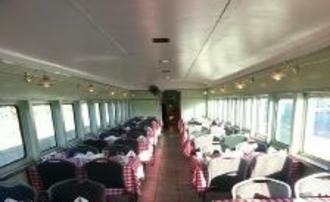 The train travels at a leisurely 10-15 miles an hour, so there is plenty of time for passengers to take pictures, and visit with the other passengers or train crew. For special moments, ride with Excursion Train pulled by the restored the #3415 Steam Engine, built in 1919 and is only operating steam engine train in Kansas today. Now departing Saturdays and Sundays in May, September and October, Wednesday through Sunday from Memorial Day through Labor Day. Call for times and special charters.